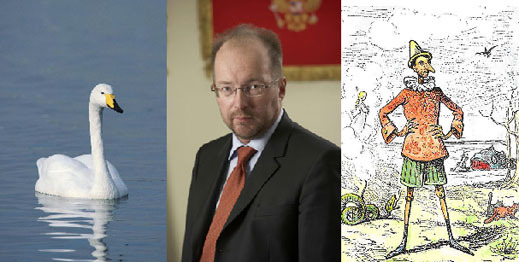 After months of bluster, denials that his job was under threat, and attempts to intimidate reporting with phantom lawsuits, Sergei Vybornov has issued a lengthy interview to a Moscow reporter, in which he intimates that his ouster — made official by the Alrosa board last Friday — was the result of plotting by rivals in the Sakha republic, and among international and Russian diamond-buyers unhappy with Vybornov’s new marketing deals. The text of the interview was published in Kommersant in its July 13, 2009, edition. Asked to say why he had left Alrosa, Vybornov said he had not quarreled with the Sakha President, Vyacheslav Shtirov, a former CEO of Alrosa, or with anyone else. Sakha sources claim that Shtirov, who had helped Vybornov take the CEO post away from Alexander Nichiporuk in February 2007, has been trying to oust Vybornov for more than six months. But that conflict, the sources have also claimed, has been subsumed by the deterioration of Alrosa’s financial position since the collapse of the diamond markets last autumn. An investigation of the company’s books by the Accounting Chamber, the state auditor in Moscow, was for a time blocked by Vybornov. The results of the audit have been classified secret, Chamber sources have told PolishedPrices.com. The appointment of the Alrosa chief executive was for many years the prerogative of the Sakha region government, until the federal government in Moscow reasserted its power, and restructured the capital and shareholding of the state-owned company to reflect a majority for the federal government, and 40% for the Sakha region. The control stake is administered by the Ministry of Finance, whose minister chairs the Alrosa board. No decision to oust the CEO or pick his replacement can be dominated by the Sakha government or by Shtirov. The key decision-makers are the Finance Minister, Alexei Kudrin, who chairs the Alrosa board; and his advisor, a VTB banker named Otar Marganya. Neither has ever responded to direct questions about Alrosa personnel or policy issues. According to Vybornov, he has negotiated long-term diamond sales agreements for a total value of $900 million. He claims the pricing formula in the contracts was “the price-list of the Ministry of Finance plus 17 %”. Vybornov now says there are 15 such contracts. A month ago, Vybornov told a US newspaper that six contracts had been signed with the price set “at a midpoint between the peak last August and this winter.” Each contract, according to Vybornov, is for not less than $200 million, and for terms of 3 to 5 years. In Vybornov’s latest claim, the new contracts include Tiffany of the US; Dali Diamonds and Diarough of Belgium; and some unidentified Israeli companies. “We have begun with [the Belgian companies] for the simple reason that the Belgian government declared the granting of guarantees to the diamond banks for a total of $1 billion A bit later, this initiative got the [additional] support of the Flemish authorities, declaring guarantees for $250 million.” Vybornov said offers to buy from “ephemeral firms” for $10 million to $20 million in diamonds, “are not interesting”. Up to 40% of Alrosa’s total sales volume has been set aside, according to Vybornov’s scheme, for these long-term contracts. After running a campaign against Lev Leviev, the leading Israeli diamantaire, whom Vybornov once accused of securing unusually favourable terms of purchase of Russian rough, Vybornov now says that Leviev “is now thinking over our offer”, implying there has been no deal yet with Leviev, or with Ruis Diamonds, Leviev’s Russian subsidiary. The 30% discount has also been charged by Vybornov’s powerful predecessor, Valery Rudakov, as the basis for Alrosa’s long-term sales contracts with De Beers’s Central Selling Organization. When Rudakov made that charge, he was the Deputy Minister of Finance in charge of the diamond sector and head of Gokhran, the state stockpile agency. No question or answer relating to the state audit of Alrosa’s books was published.